WARNING: In The Wonder Weeks, full version, all ten leaps are described. This chapter book only describes the eighth leap. 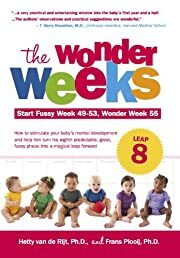 The Wonder Weeks, start fussy week 49-53, Wonder Week 55, Leap 8. How to stimulate your baby's mental development and help him turn this predictable, great, fussy phases into a magical leap forward, describes in easy-to-understand terms the incredible developmental changes that all babies go through 55 weeks after the due date (start fussy period at 49-53 weeks). In the world of “programs” for the first time your baby is able to perceive a whole sequence of actions as one thing. Now he recognizes that putting a dirty plate in the water, moving the brush or sponge over it, and placing it in the rack for the water to drip down is “washing dishes.” He loves to help you with such tasks. And of course he likes to produce a lot of foam.